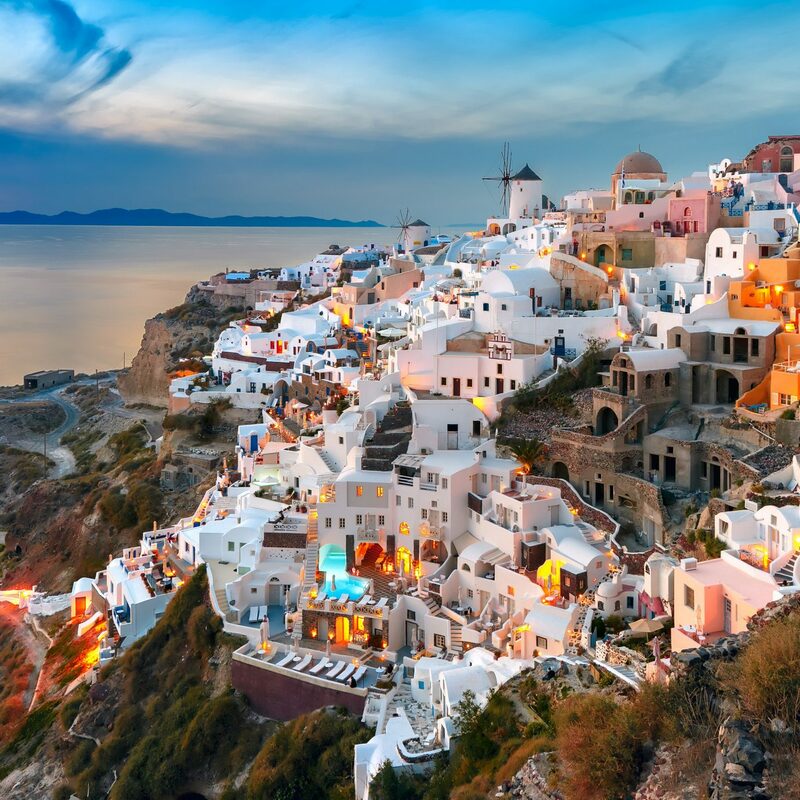 Whether you're hoping to carve out a slice of paradise for mere pennies or you're willing to drop a couple thousand $$$ on a once-in-a-lifetime trip, we've got you covered. From the Bahamas and St. Lucia to Bali and Barbados, here are 18 budget and ball-out island hotels we swear by. 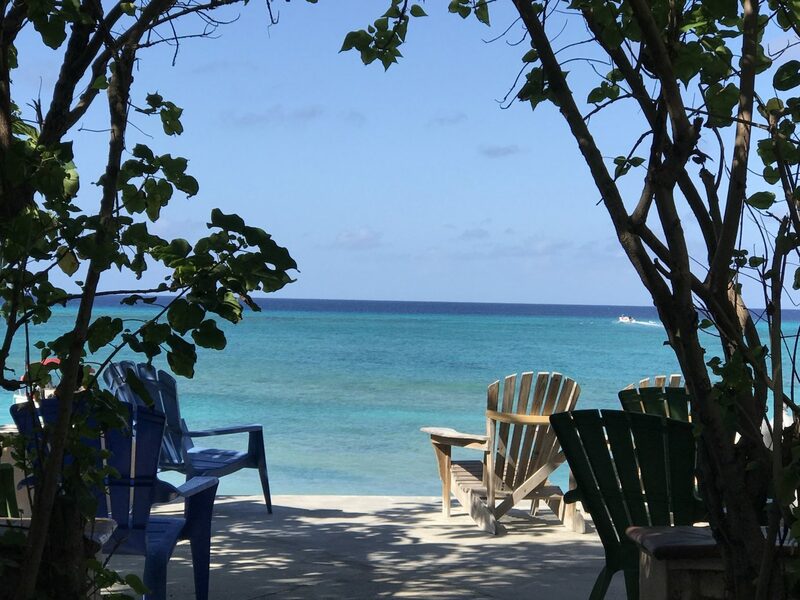 Just south of the Bahamas, a mere 3.5-hour flight from NYC, Turks and Caicos (what’s actually a string of 40 coral islands) has a flair for the dramatic. More than 200 miles of silky sand collide with one of the world’s largest coral reefs, and that’s just the start of it. 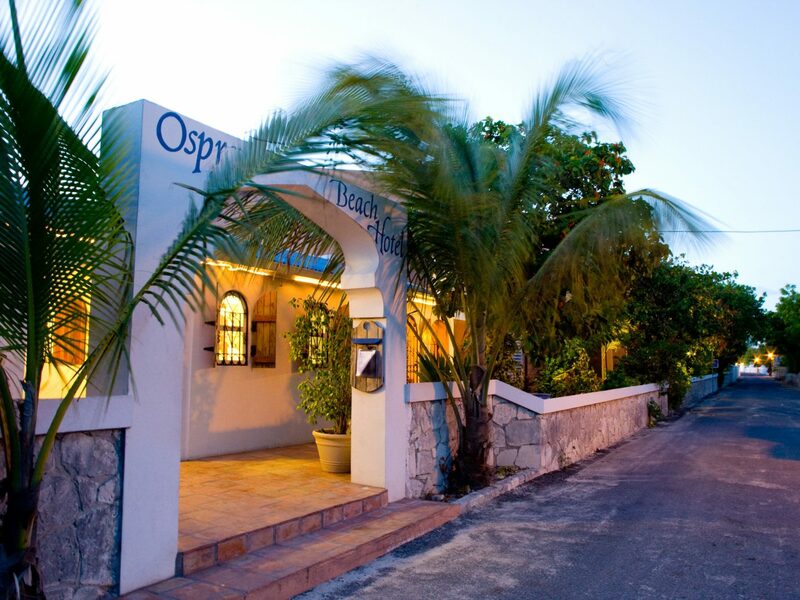 In Grand Turk, the laid-back Osprey Beach rolls out oceanfront rooms, dive packages, and lively BBQs every Wednesday and Sunday night for just a fraction of what others are charging. 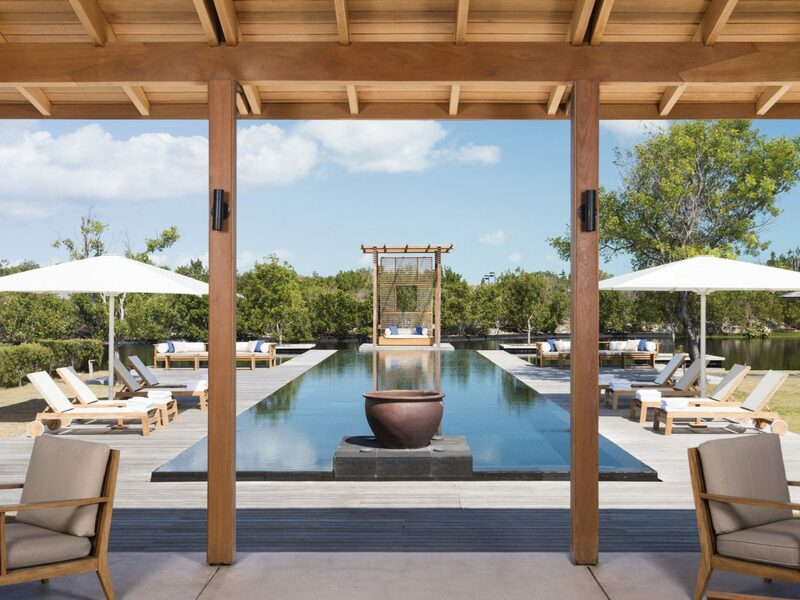 A favorite among bronzed and beautiful celebs (see: Sofia Vergara, Christie Brinkley, and Ben Affleck), Turks and Caicos is no stranger to a buzzy resort or two. 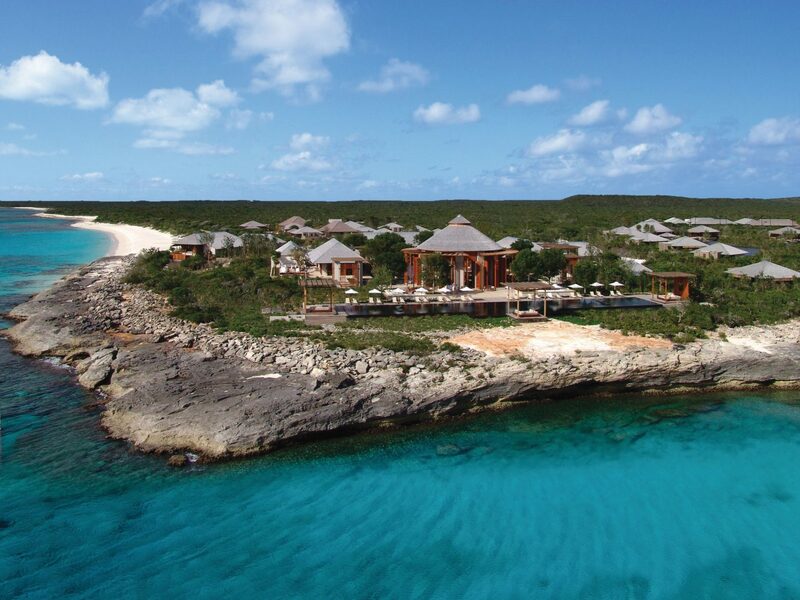 On the top of the island’s most-impressive list is Providenciales’—aka Provo’s—Amanyara, which settles in among the turquoise waters of Northwest Point Marine National Park. 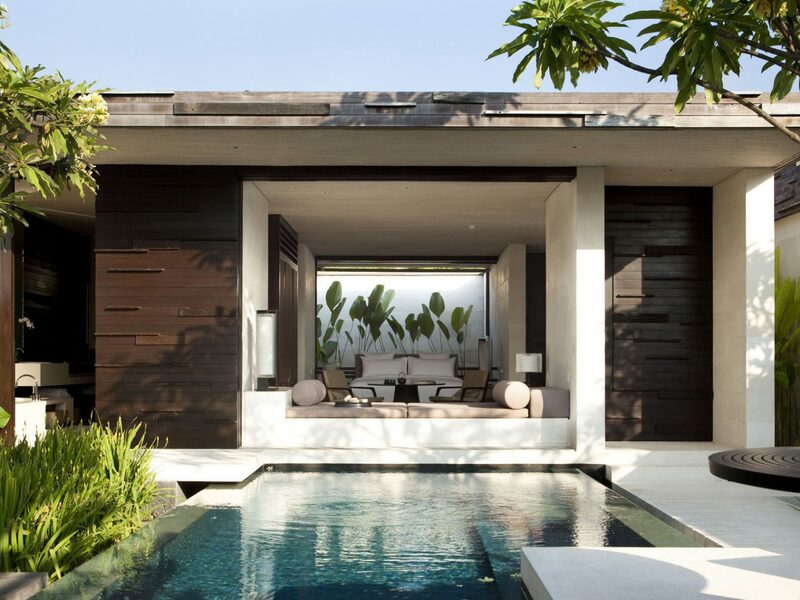 The resort’s moniker quite literally translates to “peaceful place,” and they more than pull it off with luxurious open-air pavilions and villas that feature floor-to-ceiling windows and the Aman brand’s signature minimalist decor. 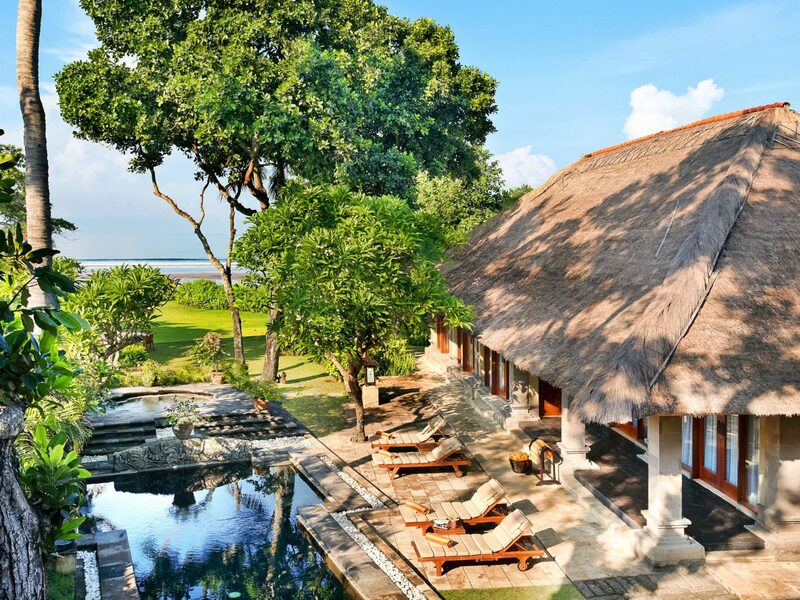 Yes, flights to Bali may not be the cheapest, but rest assured you can save elsewhere by bedding down in a “budget” (read: super luxe) beachfront oasis. 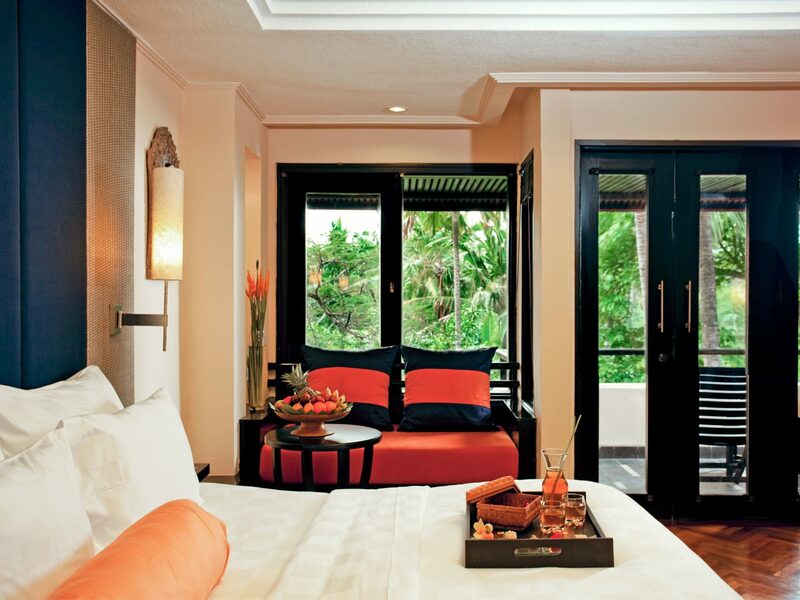 At The Royal Beach Seminyak Bali, all spacious rooms (the smallest start at 430 square feet) come with tropical garden views from the vantage of a private balcony, and the best part? 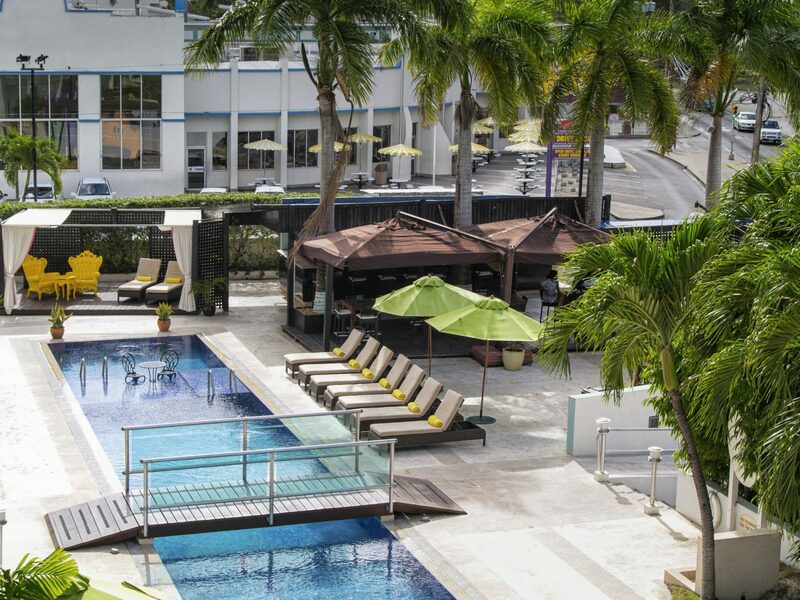 Rooms at the island hotel go for less than $200 a night. 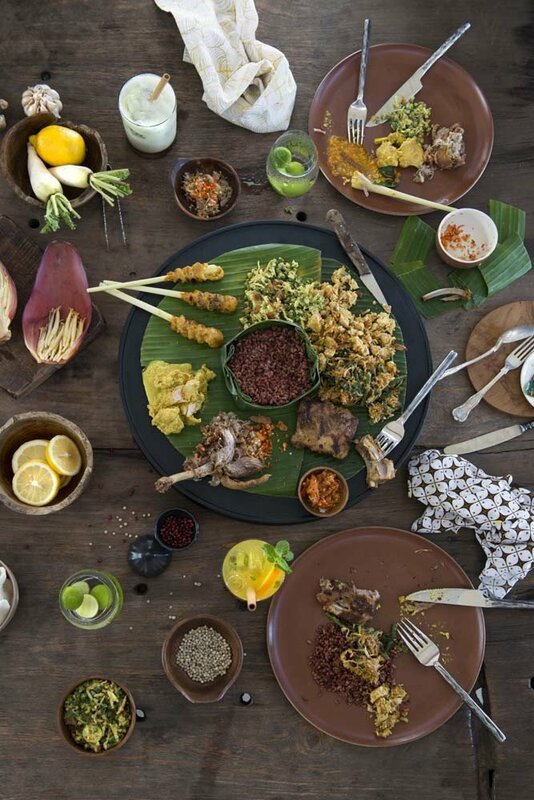 If you’re down to go all out on your Indonesian retreat, the eco-friendly Alila Villas Uluwatu is your place. 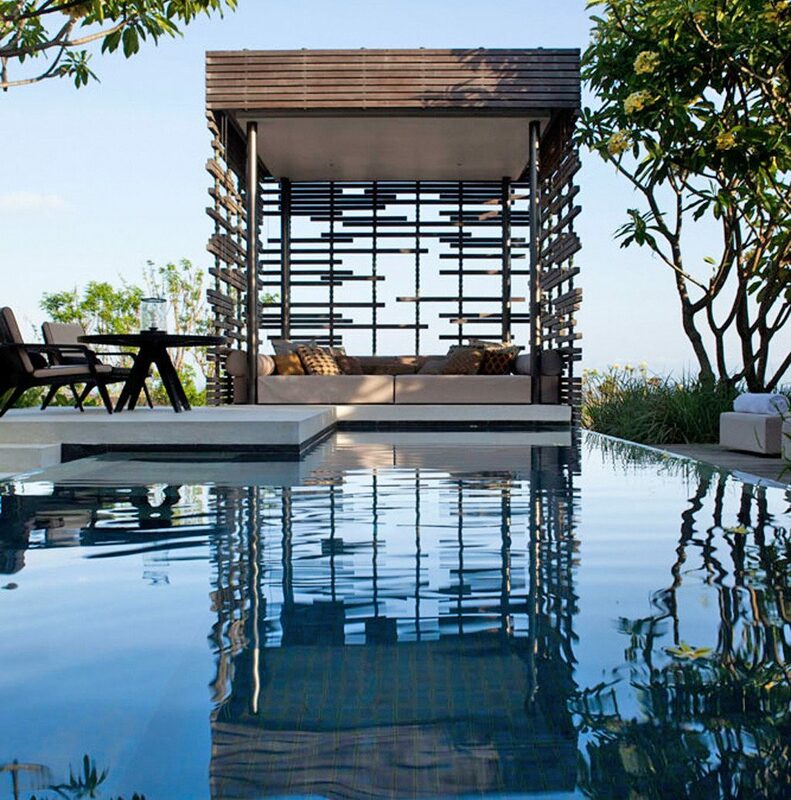 The all-villa resort rests on a limestone cliff some 330 feet over the Indian Ocean, just minutes from Uluwatu Temple and the Uluwatu Cliffs. Open floor plan villas are done up in wood and stone with Balinese details sprinkled throughout; moving outside, private cabanas and plunge pools capitalize on hillside views. If you’re looking for a cookie cutter all-inclusive that will all but tuck you in at night, then Hotel Mockingbird Hill isn’t for you. 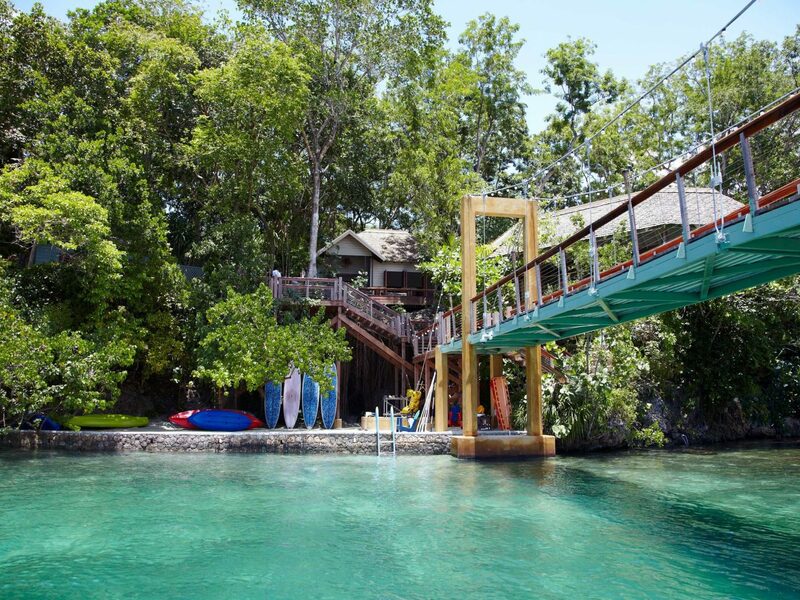 But if what you’re after is old-world Jamaican hospitality, then it’s time to head to Port Antonio to check into one of our top-choice, budget island hotels. 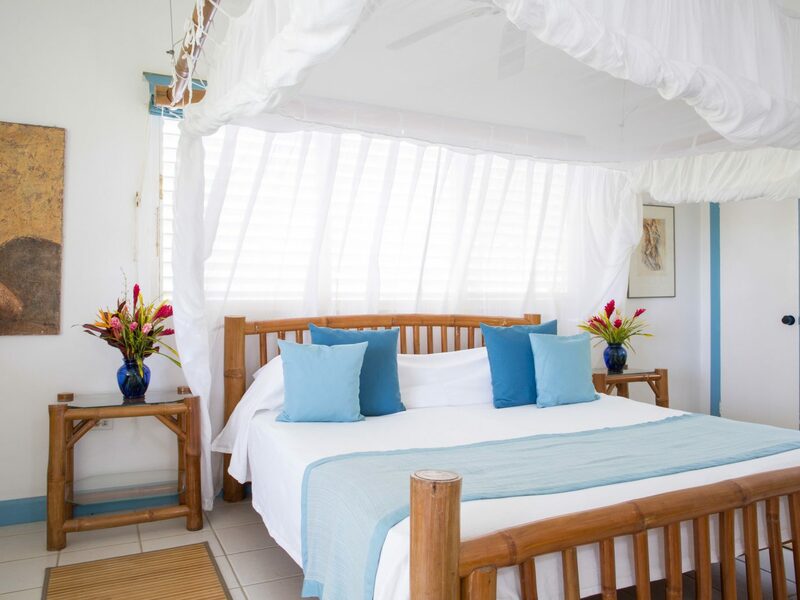 The 10-room eco-boutique is tucked between the coffee-cultivating Blue Mountains and the breezy Caribbean Sea, not far from Frenchman’s Cove Beach. 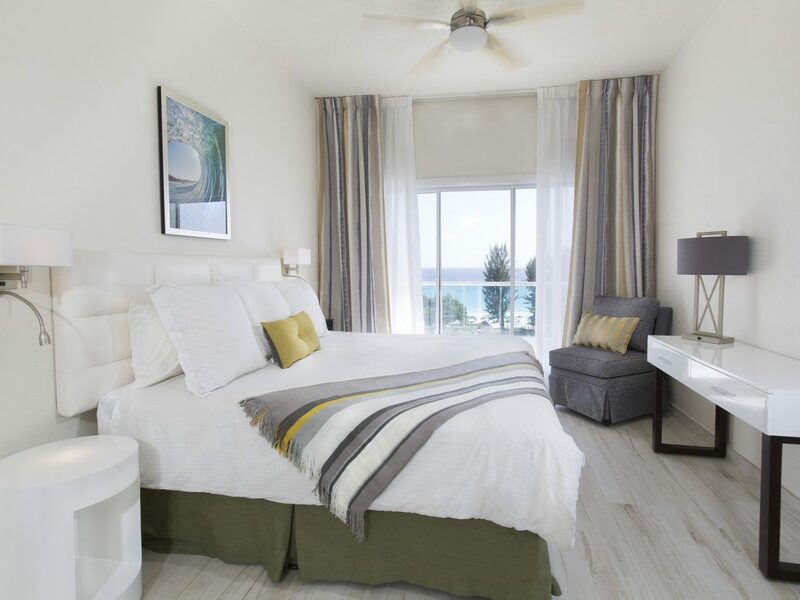 Locally-furnished guest rooms make the most of their setting with plantation shutter doors. 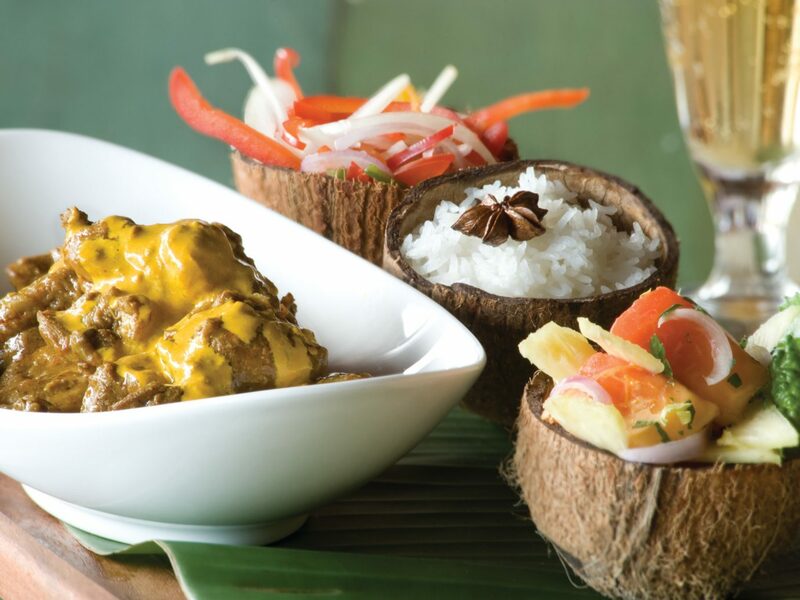 The spot’s food isn’t so bad either; al fresco Mille Fleurs—the city’s most raved about restaurant—serves up flavorful traditional recipes (jerk spiced chicken and pineapple stew is a fave) as well as dishes of Caribbean-European fusion. 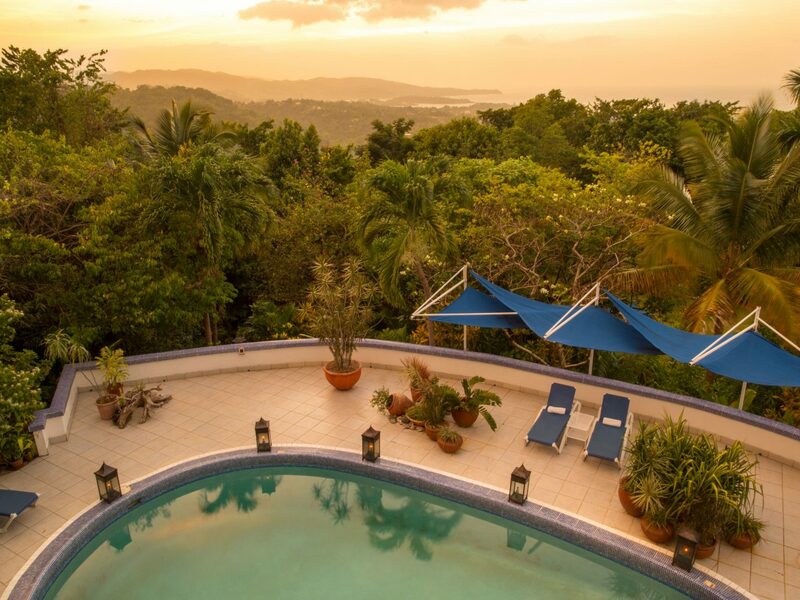 On the romantic north coast of Jamaica, roughly 20 minutes from Ocho Rios, lies GoldenEye—the once privately-owned retreat that would inspire Ian Fleming to pen each and every James Bond book. 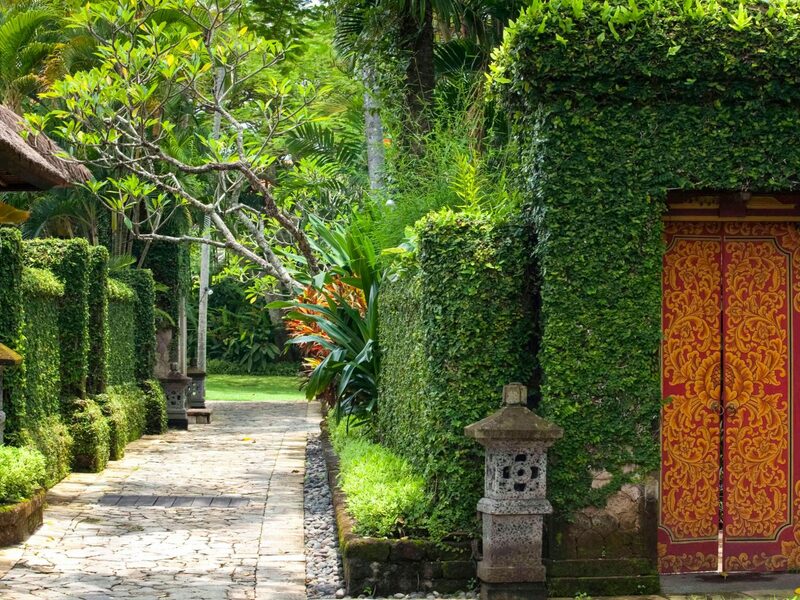 Only fate can decide whether or not you write one of the most popular series of all time during your stay, but the space does dole out inspiration. 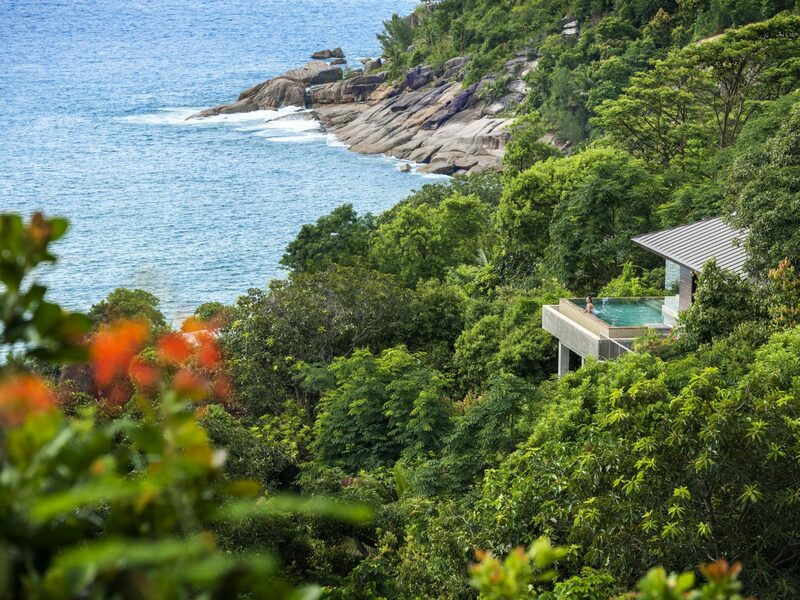 Villas—with antique clawfoot tubs, outdoor rain showers, and beds draped in ethereal canopies—splay out amidst tropical flora and fauna, but the Fleming Villa is a bonafide resort unto itself. 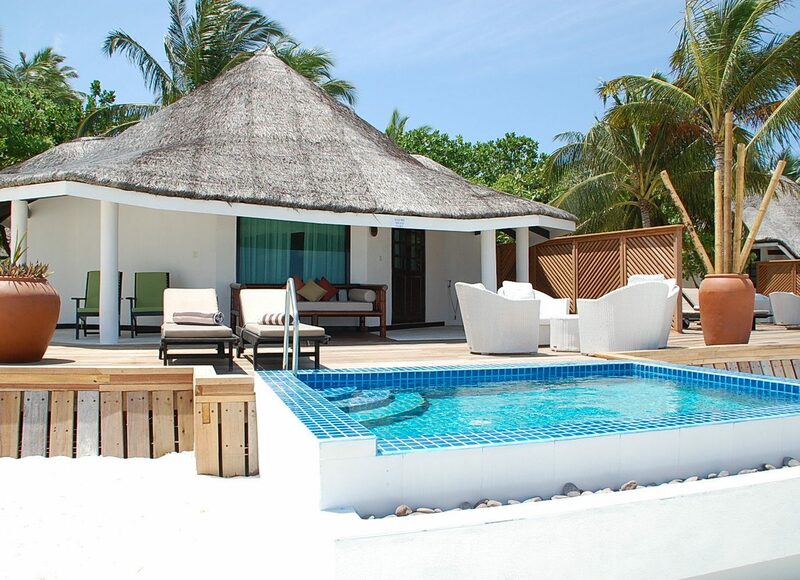 The five-bedroom villa boasts a private beach, pool house, and an around-the-clock staff (butler, housekeeper, and cook). 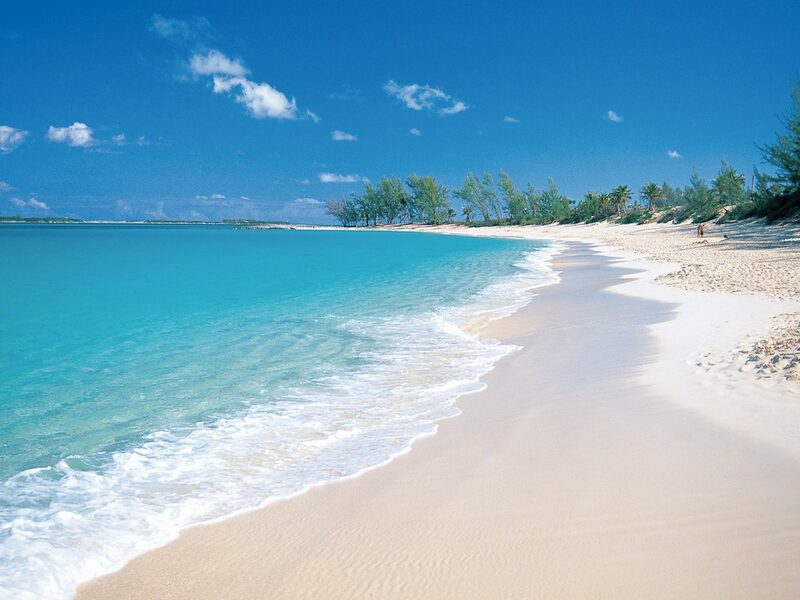 Like most Caribbean islands, Barbados harbors its fair share of stunning white and pink sand beaches. 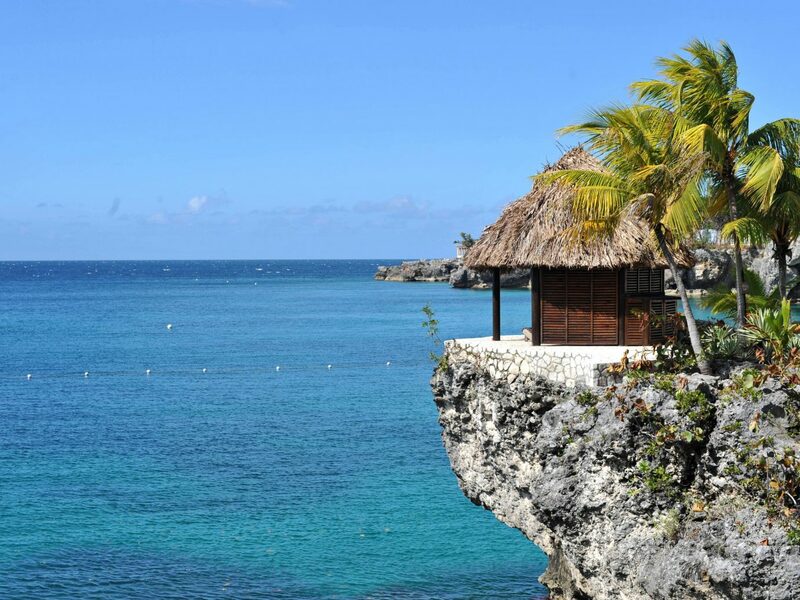 But beyond velvety shores dotted with sunbathing holiday-makers, the West Indies’ gem also possesses limestone and coral cliffs, renowned botanical gardens, and in cities like Bridgetown and St. Lawrence Gap, raging nightlife. 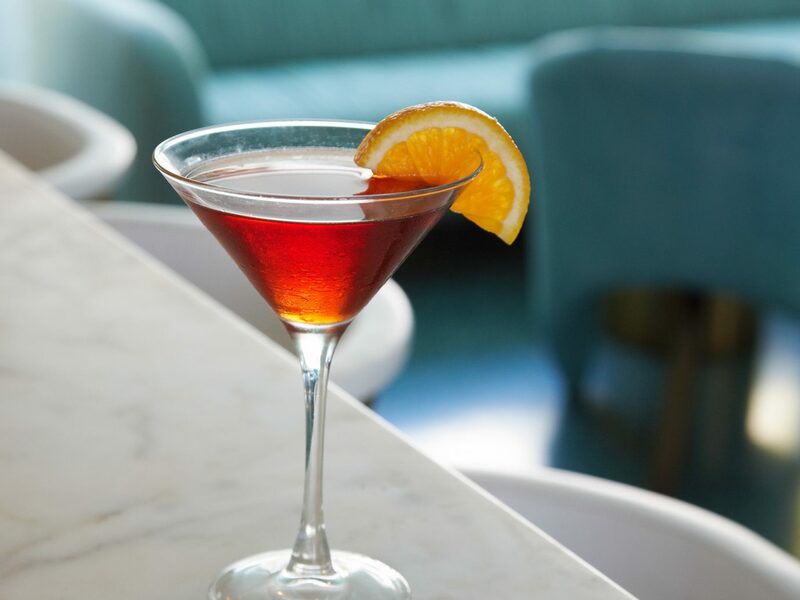 If you’d rather spend more on experience than five-star digs, look to the all-suite South Beach Hotel. 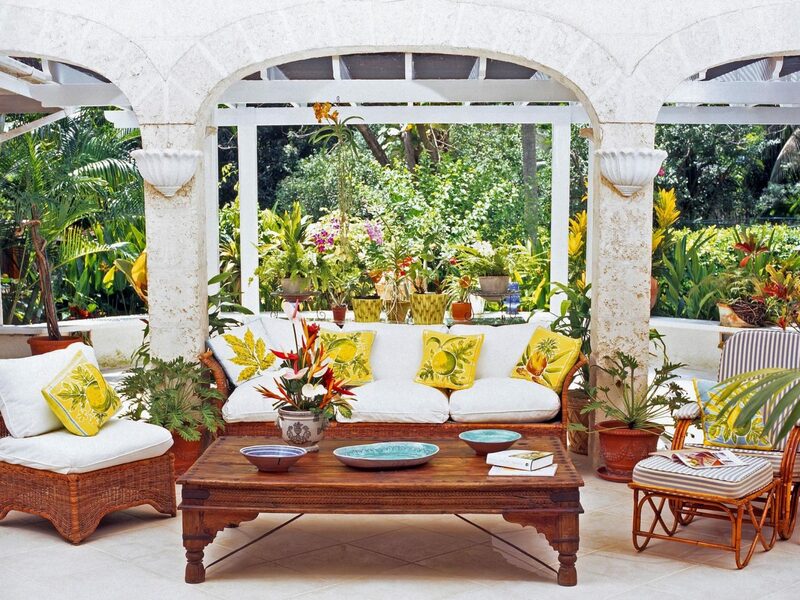 More contemporary than Caribbean, rooms are done up in crisp white, accented with a few statement pieces here and there. 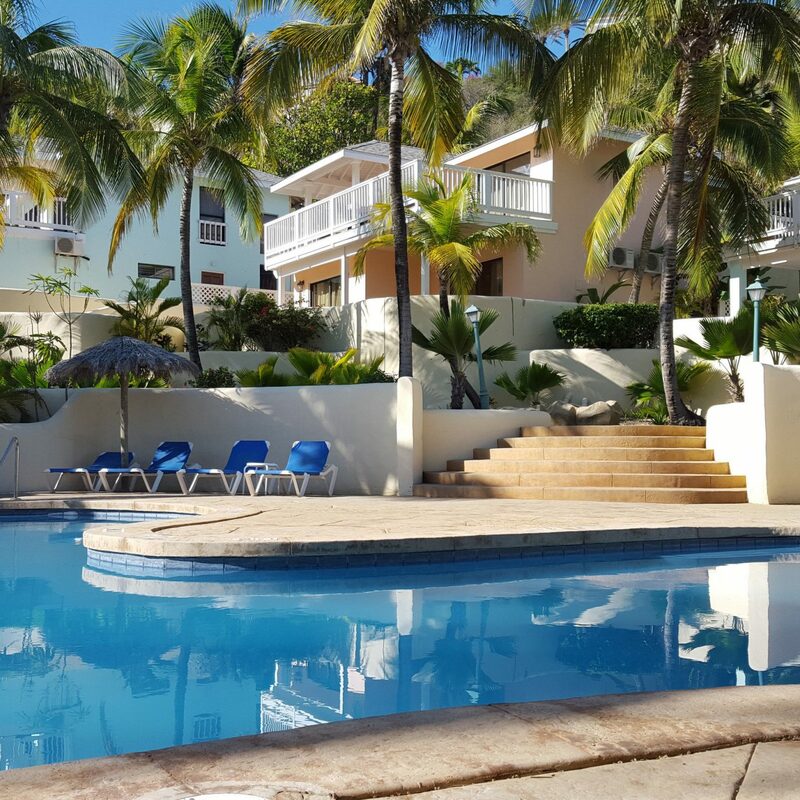 Outside, sun loungers dot the sides of a resort-length pool, while Rockley Beach and the scenic South Coast Boardwalk are just steps away. 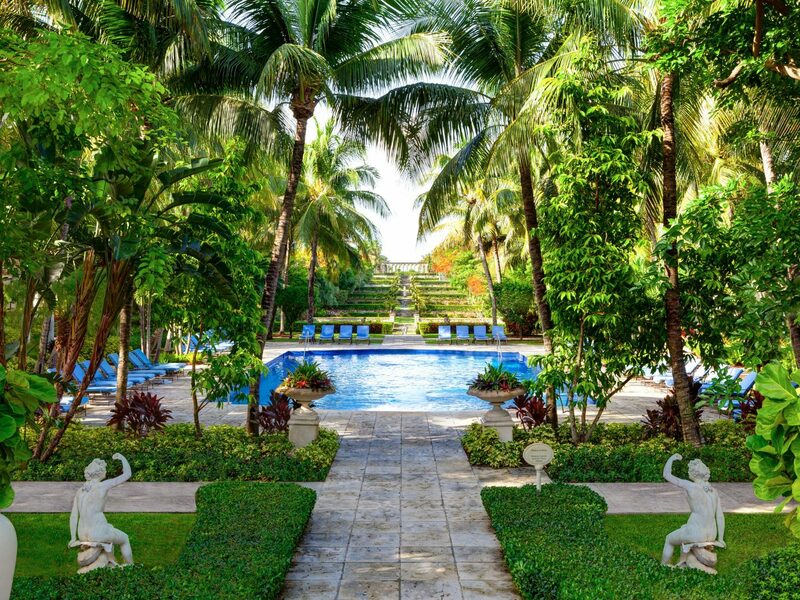 On Barbados’s Platinum Coast, the beachfront Coral Reef Club is the face of colonial Caribbean charm from shuttered plantation windows to intricate wooden fretwork. 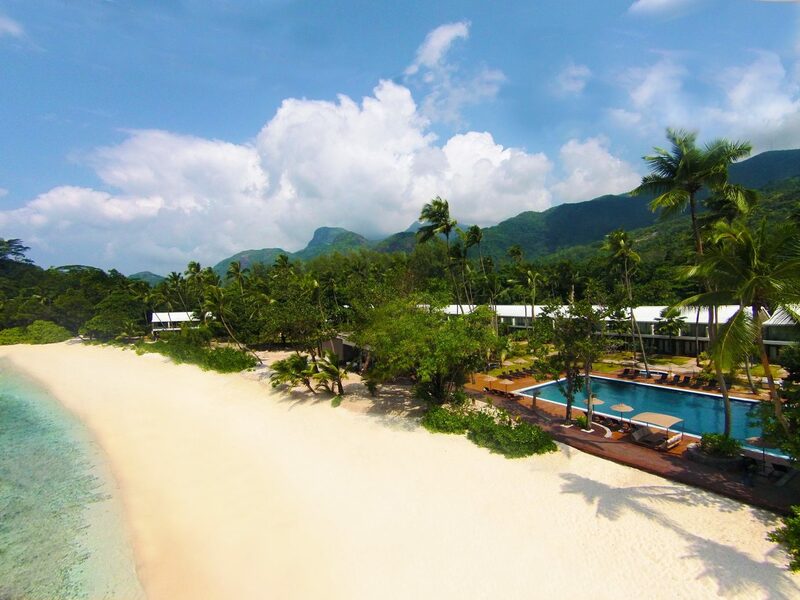 Spread out over 12 beachfront acres, with meticulously landscaped gardens of frangipani and bougainvillea, accommodations range from one-room cottages to ultra-elegant suites. 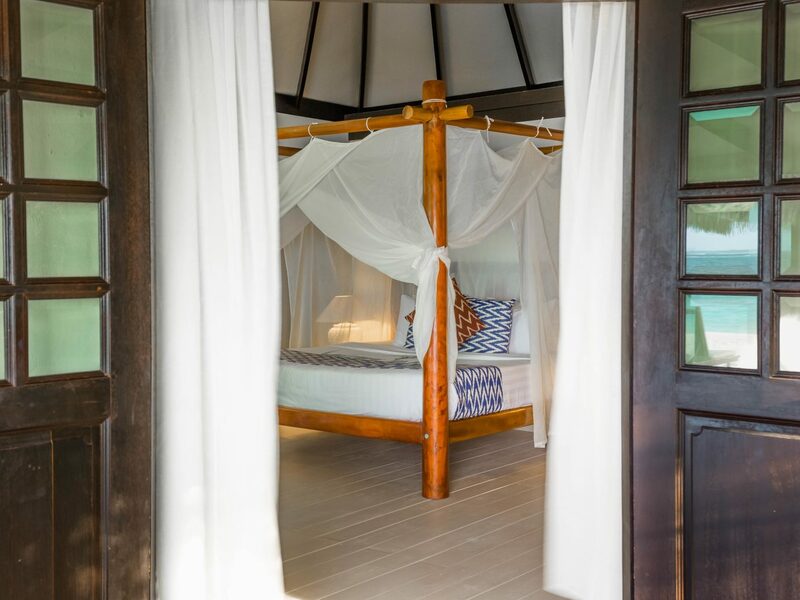 Nab one of five Luxury Plantation Suites for a canopied four-poster bed, separate dressing room, and private sundeck with a plunge pool. 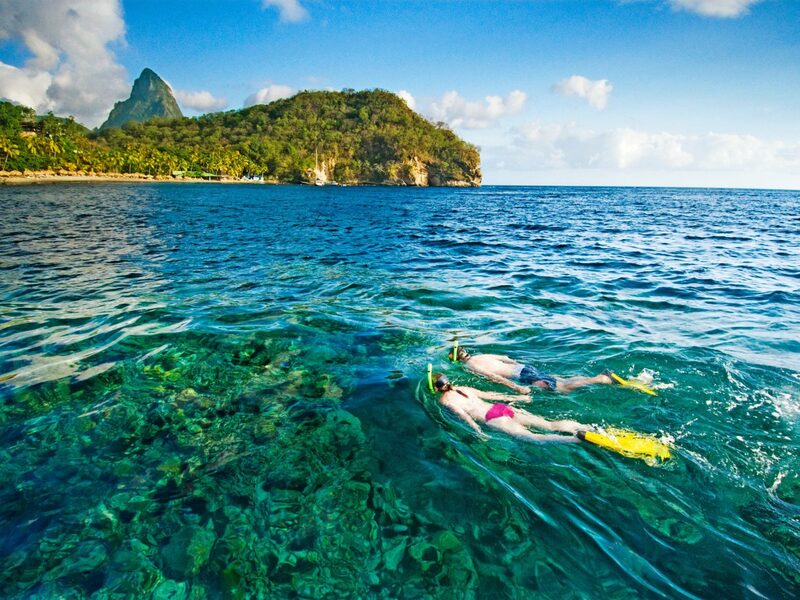 Laid-back St. Lucia has a lot to brag about: the dramatic twin Pitons, verdant hillside rainforests, and handfuls of romantic boutique stays. 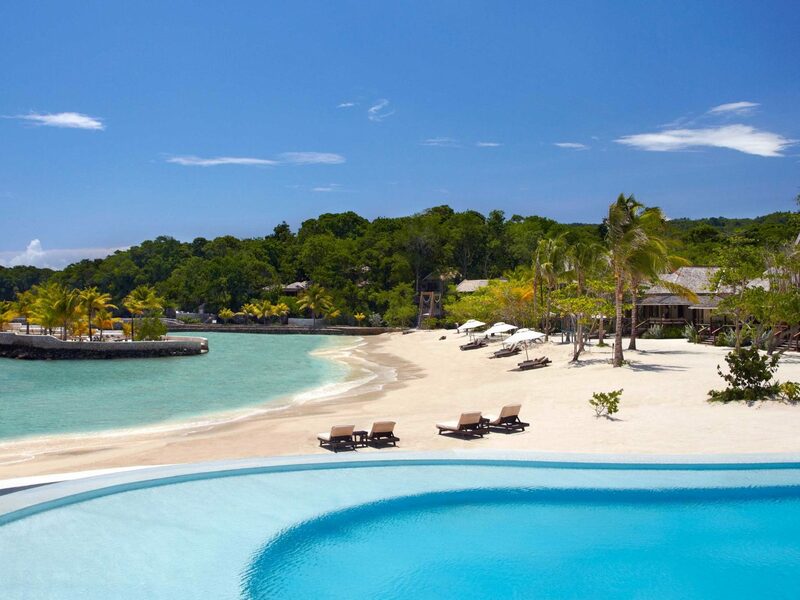 While the most sumptuous of the bunch can run you a couple K a night, affordable digs—like the secluded Marigot Beach Club—are still lust-worthy. 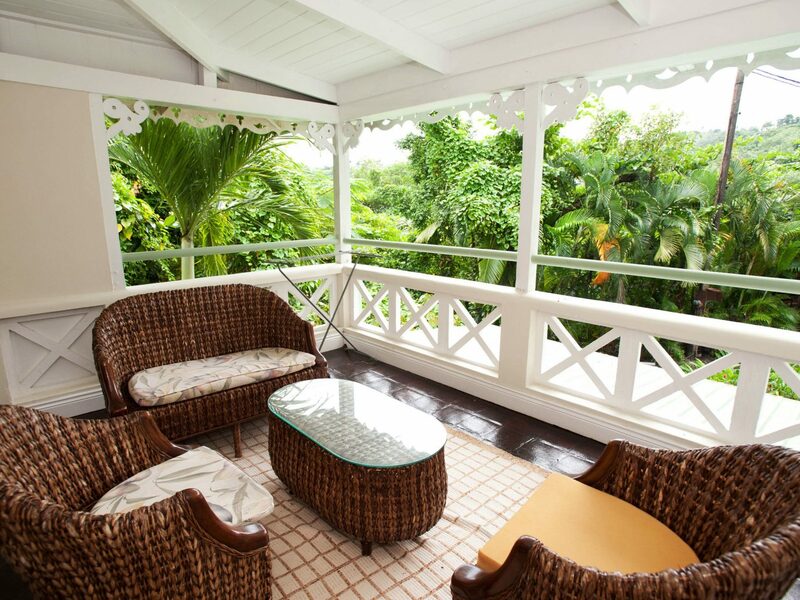 The villa-style hotel sets its roots in Marigot Bay, a densely forested enclave on St. Lucia’s mangrove-fringed western coast. 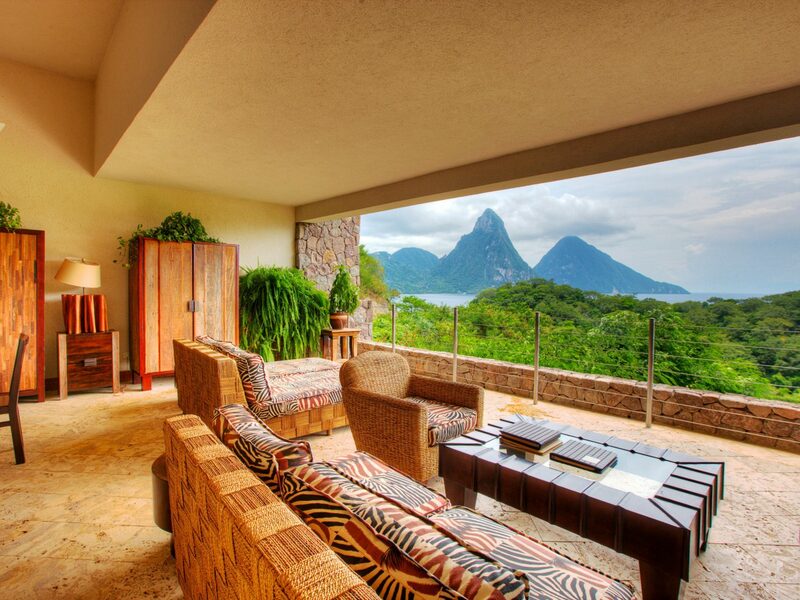 Rooms are authentic and relaxed, with tiled floors, simple linens, and wicker furniture – all which lend focus outdoors, to St. Lucia’s astonishing natural beauty. Looking for a little adventure? The onsite dive shop can hook you up with gear, tips, and even scuba lessons so you can get to exploring the island’s diverse marine life. You know those jaw-dropping views that photographs simply can’t capture? Yeah, this is one of those spots, and trust us when we say the view alone is worth the room rate. 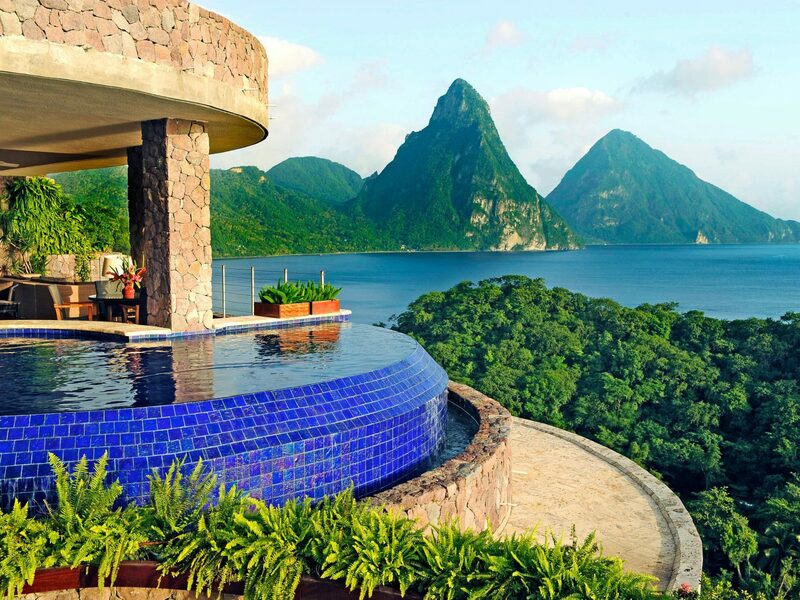 Jade Mountain carves 28 suites into its unspoiled hillside locale, dropping each room’s fourth wall in favor of an open-air design that gives precedence to the iconic Pitons. Palatial digs work off a decidedly tropical palette, with bedspreads, table settings, and cushions done up in vibrant greens, purples and pinks. 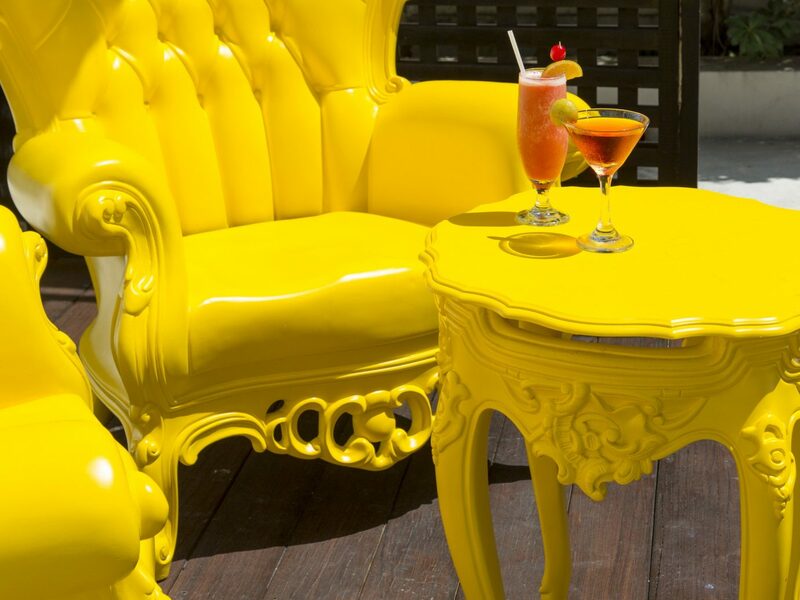 If you just can’t be bothered to do anything other than drink in the kaleidoscope of Caribbean colors, lucky for you, the resort’s dedicated major domos (personal concierges) are on hand to cater to your every need. Serene Atlantic waves, pink sandy shores, and tourist-friendly resort towns make the Bahamas a go-to for sun-seekers everywhere. But visiting a high-demand destination doesn’t have to mean paying a high price for your hotel stay. 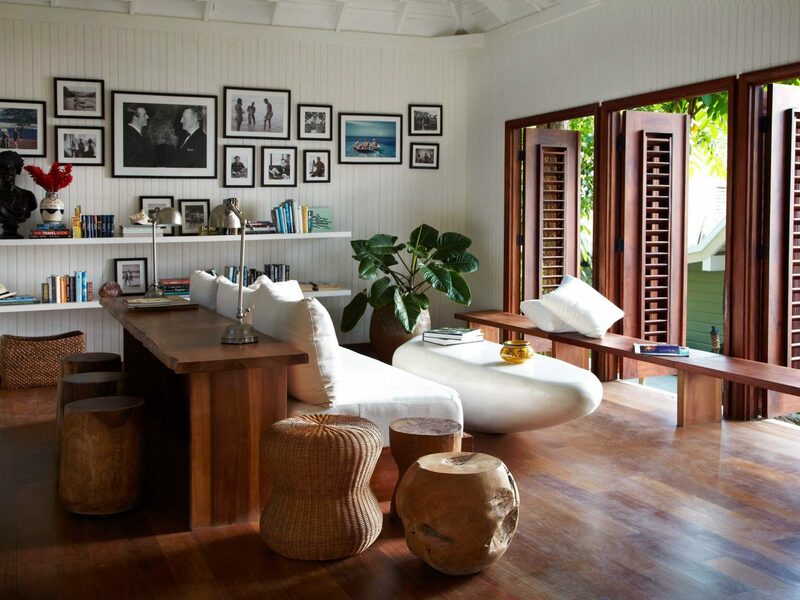 Since it hit the Harbour Island scene in the 40s, the Bahamas’ Rock House has gone through the motions, transitioning from a private home to a B&B to a rental property and now a luxe, delightfully-affordable boutique. 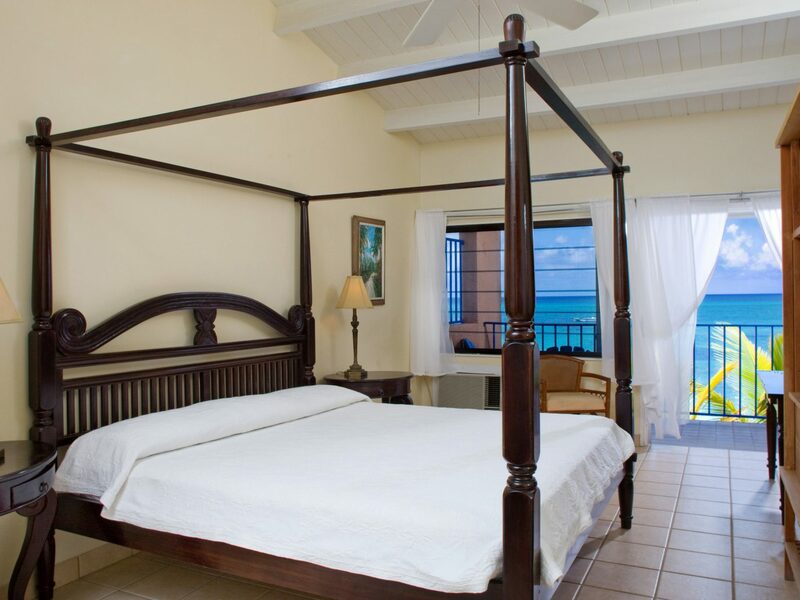 Simple guest rooms and suites all feature king-size beds, walk-in showers, and the option of breakfast done poolside. 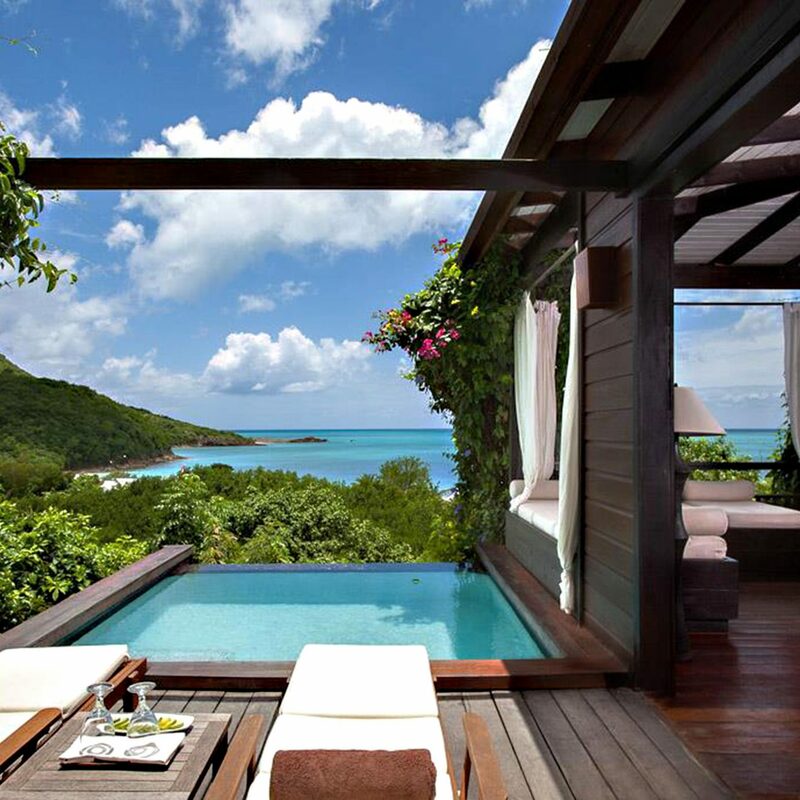 With celeb-frequented hotels in some of the hottest, most exotic locales (see: Dubai, Cape Town, the Great Barrier Reef), the Four Seasons brand knows a thing or two about hosting a glitzy getaway. 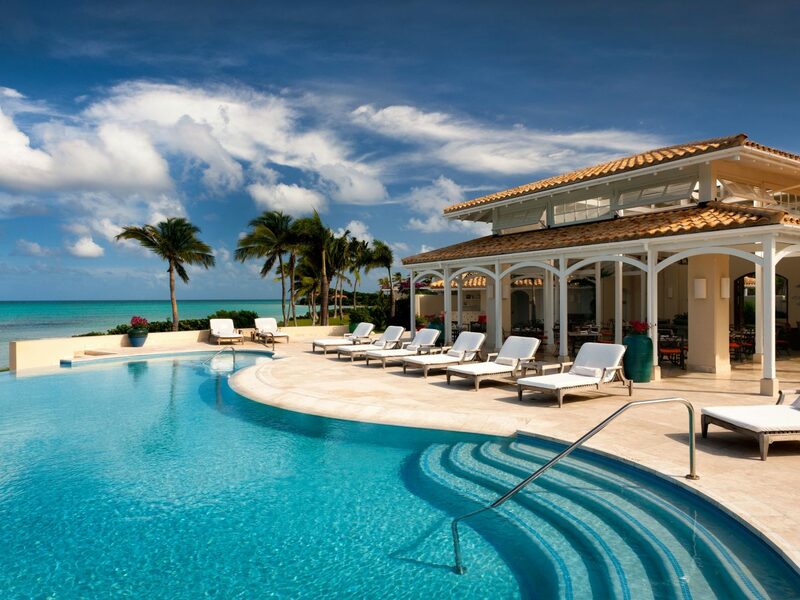 The Ocean Club, tucked away on 35 acres of swaying coconut palms and silky sands with an 18-hole Tom Weiskopf–designed golf course, is no exception. 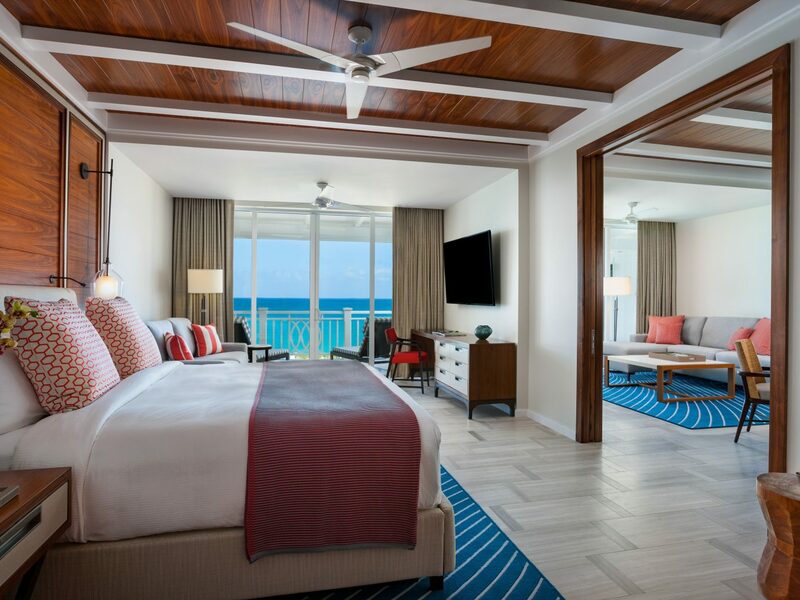 Design-wise, most of the rooms and suites fall under island preppy (think natural woods, sprays of turquoise, and boldly-patterned throw pillows). 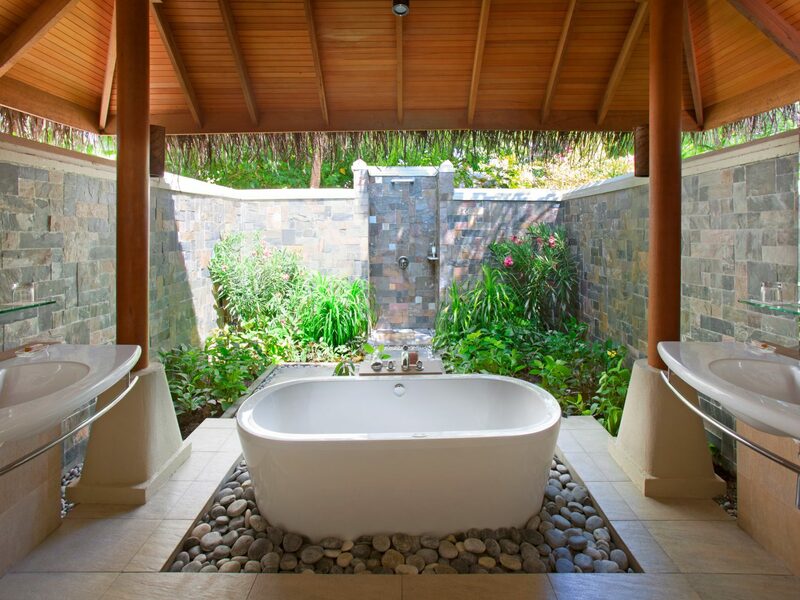 But the Bahamas meet Bali at the property’s spa, where holistic treatments performed in open-air garden villas begin with a traditional foot washing ritual. 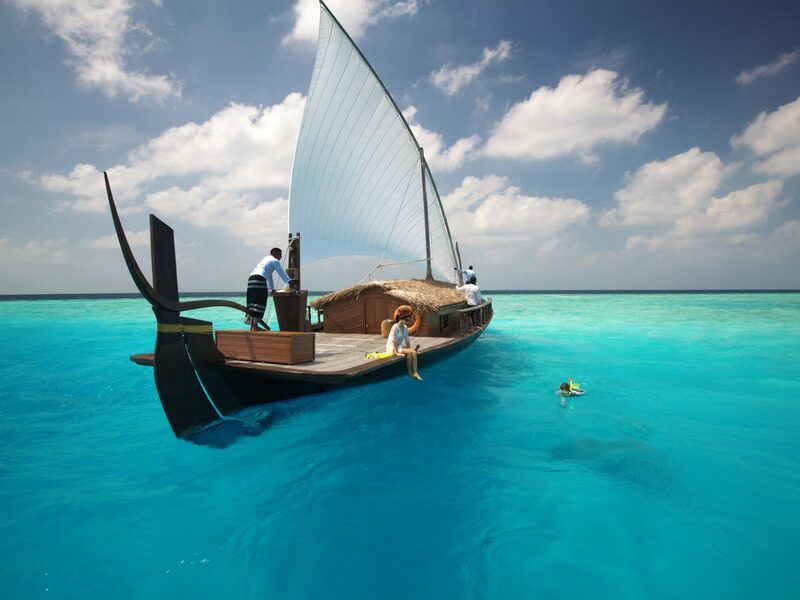 The Maldives top buckets lists around the world for myriad reasons: impossibly blue waters, live coral reefs teeming with exotic marine life, private atolls ringed by sugar-white sand, and more. 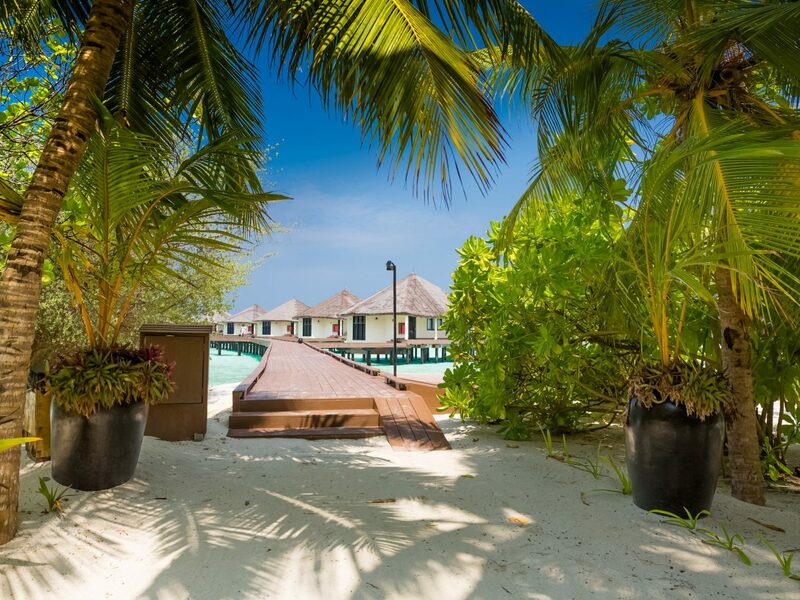 While the Maldives are a perpetually expensive destination, you can still nail down a relative deal. 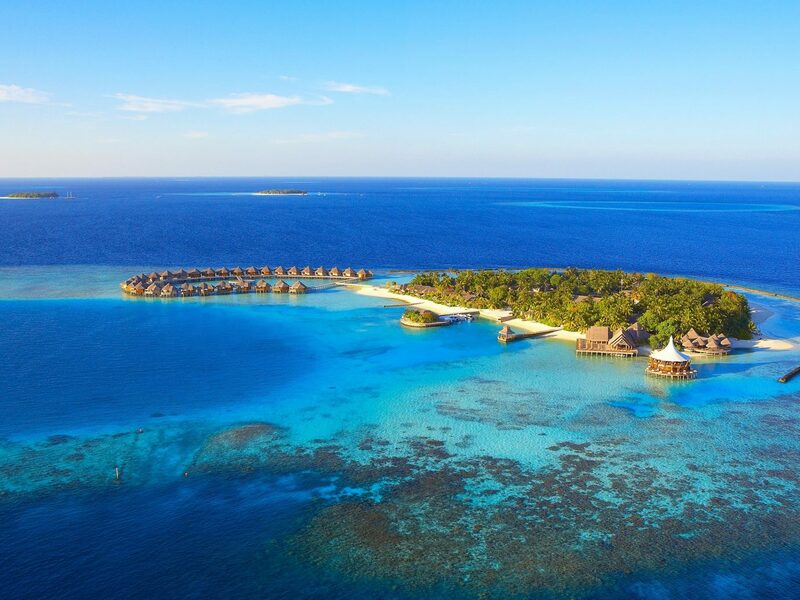 The all-inclusive Kihaa Maldives delivers some of the island’s top must-haves, arranging 124 airy villas (with outdoor rain showers) and an overwater spa on a lush, private island in the Baa Atoll. 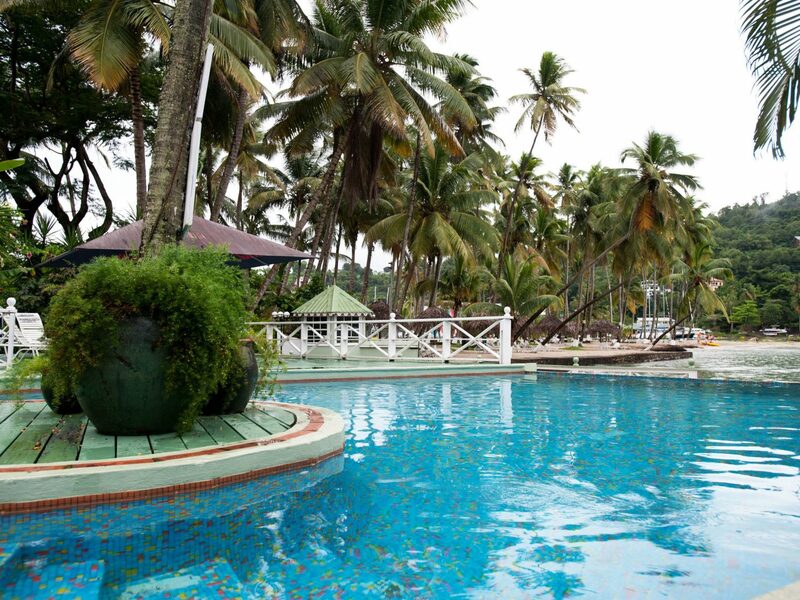 With rooms starting at an astounding 828 square feet, the resort certainly pulls out the wow-factor for less. 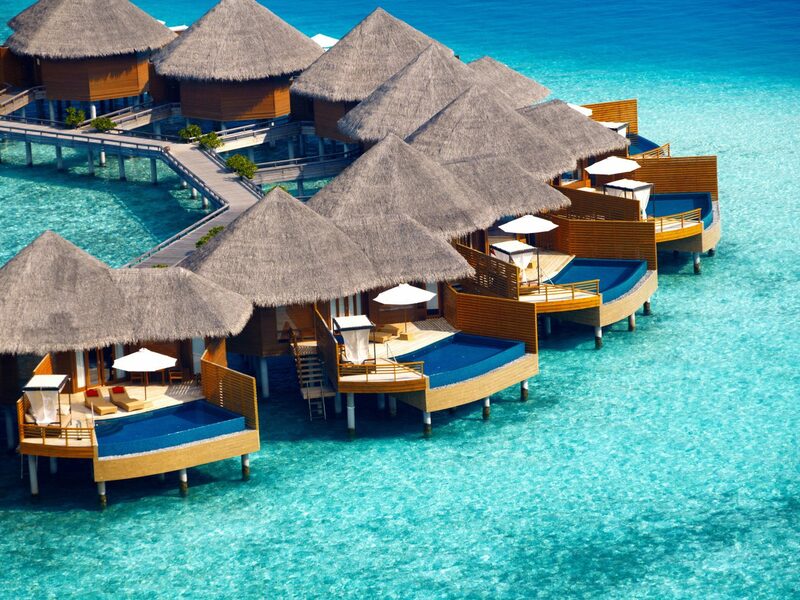 Baros Maldives is the type of retreat you stalk relentlessly on social media and make a vision board for in the hopes you can honeymoon there. Is it super pricey? Yes. But is it worth its salt? Also yes. 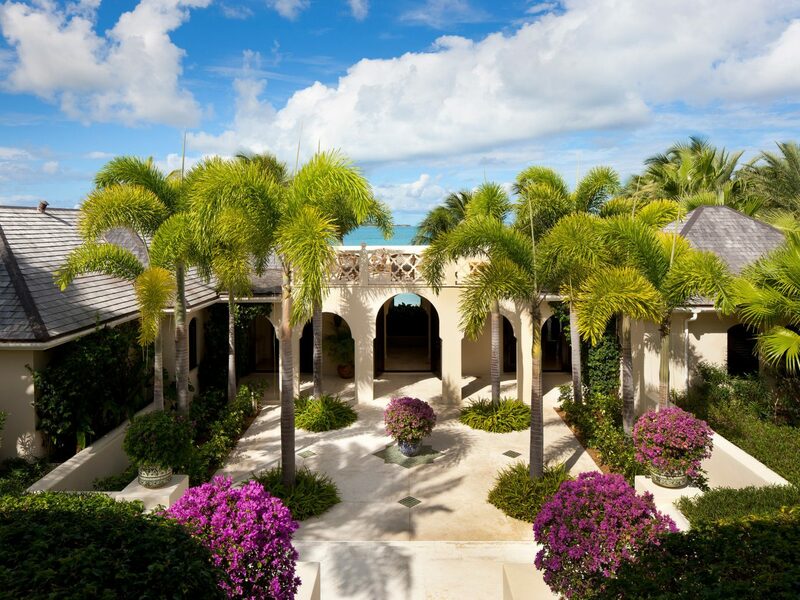 The romantic boutique resort has a living house-reef, for goodness’ sake. 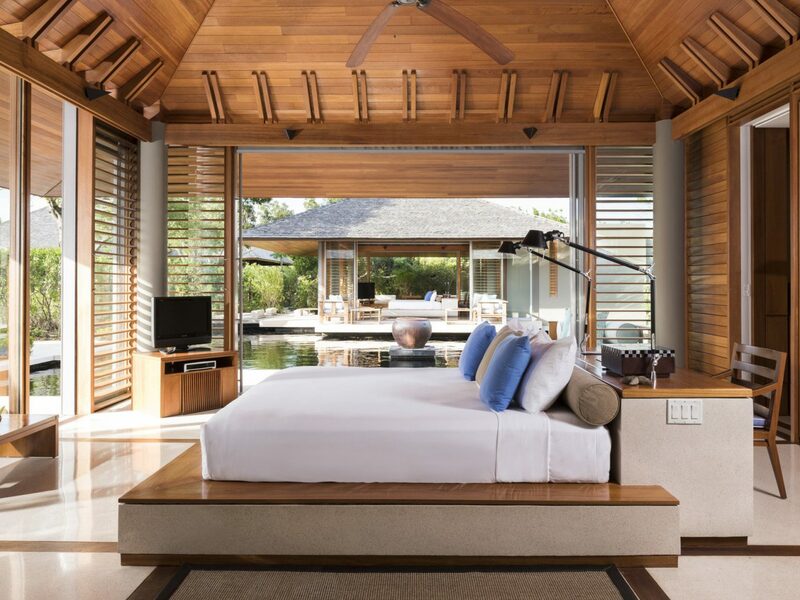 While every form of accommodation is more than cushy, Water Pool Villas steal the show with private sunbathing decks, plunge pools, and direct lagoon access. 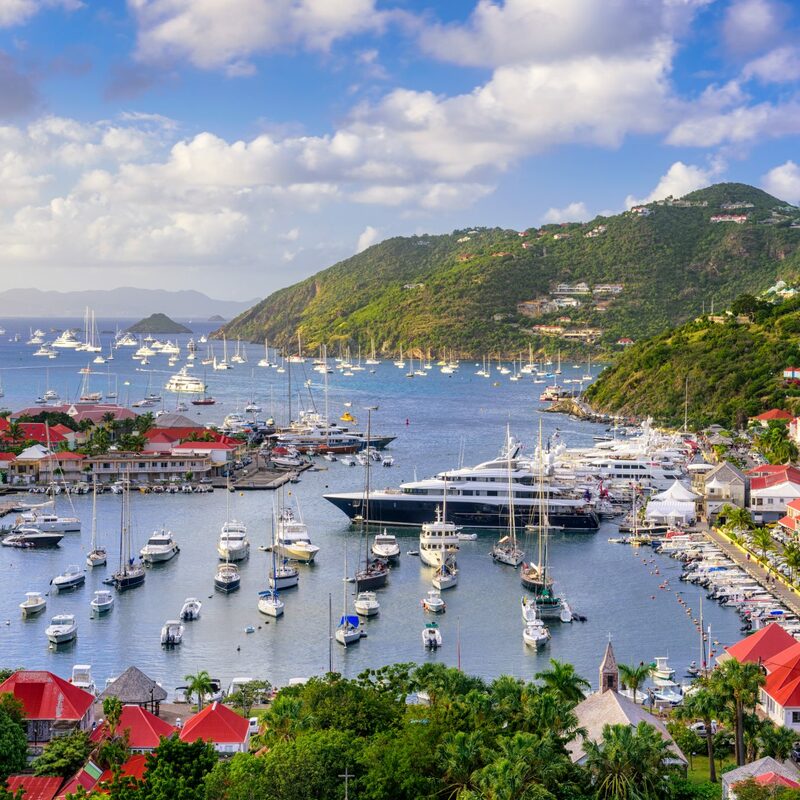 Antigua is every bit as dreamy as it looks—just ask the yachties who perpetually populate the marinas in English Harbour and Falmouth. 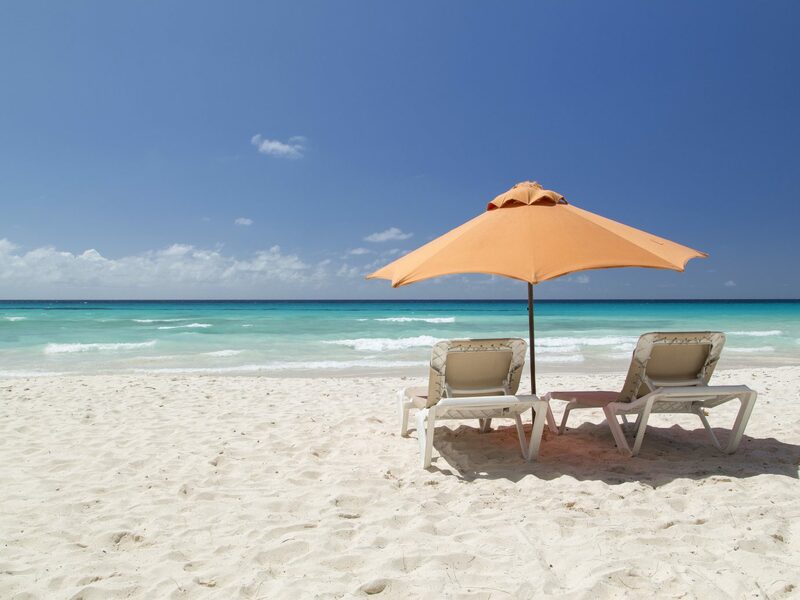 Catamaran owner or not, Antigua is accessible to travelers of every tax bracket; you just have to know where to look. 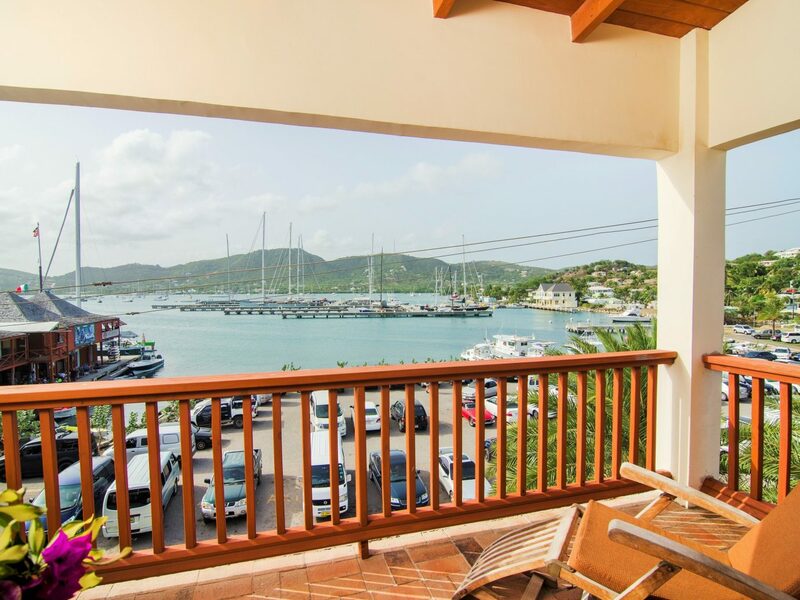 Rooms at the Antigua Yacht Club Marina Resort start at an inconceivable $150, and each come with their own private balcony that looks out over the docks. So technically, Jumby Bay isn’t part of mainland Antigua at all. The Christopher Columbus-discovered isle, reachable only by boat, rests two miles north of the island. The exclusive, 300-acre haven is all rambling bike paths, serene shore, and residential-style accommodations that marry old and new. When you feel like mingling, don your brightest whites and heat the to the weekly White Night BBQ at the seaside Verandah restaurant. 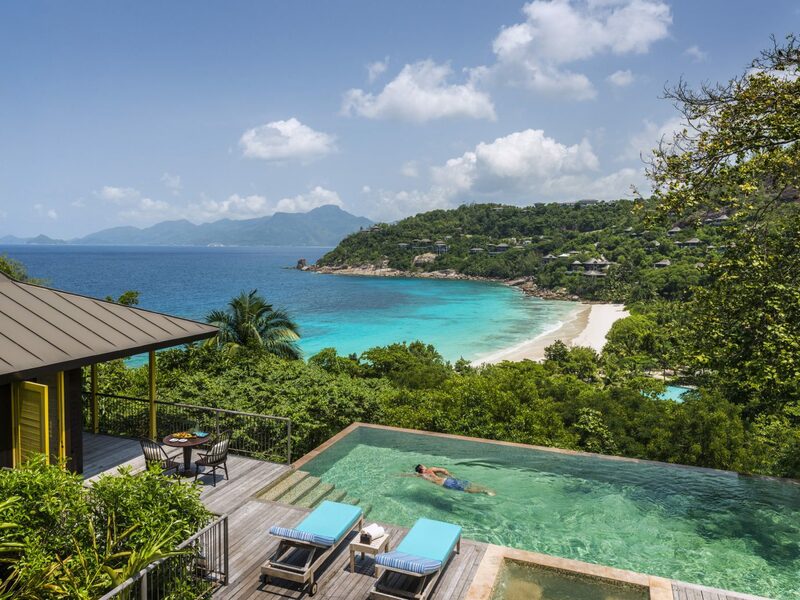 Floating in the Indian Ocean off the eastern coast of Africa, not far from Mauritius, Madagascar and Réunion, is the 115-island archipelago of Seychelles. 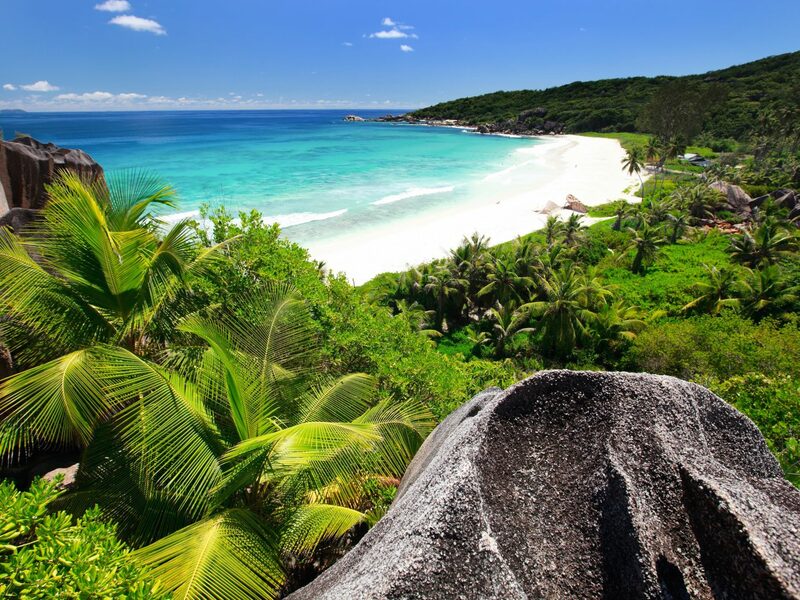 While to this day, most of the nation’s islands remain uninhabited, visitors frequent the resort-dotted Mahé, Praslin, and La Digue to sleep amongst granite cliffs, lush jungles, rare wildlife, and postcard-perfect beaches. 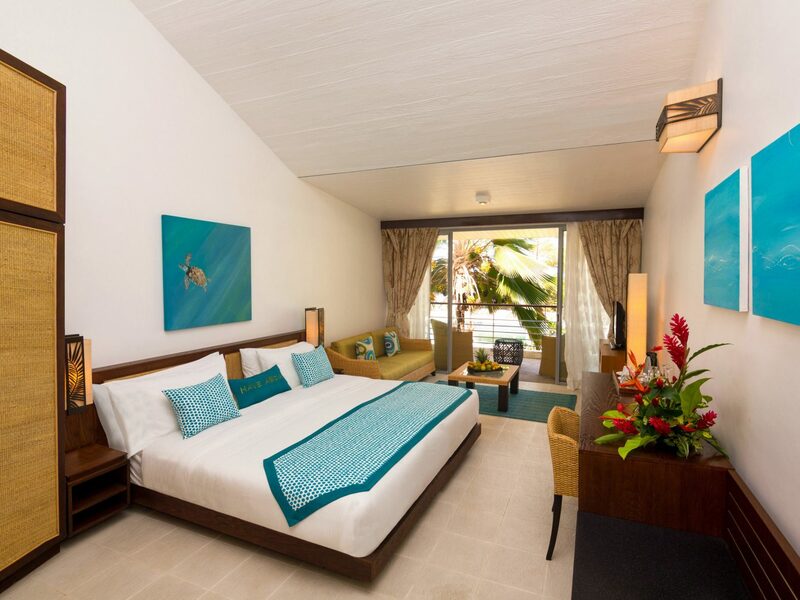 Naturally, such luxuries come at a price, but the AVANI Seychelles Barbarons Resort & Spa is an option that won’t require emptying your savings. 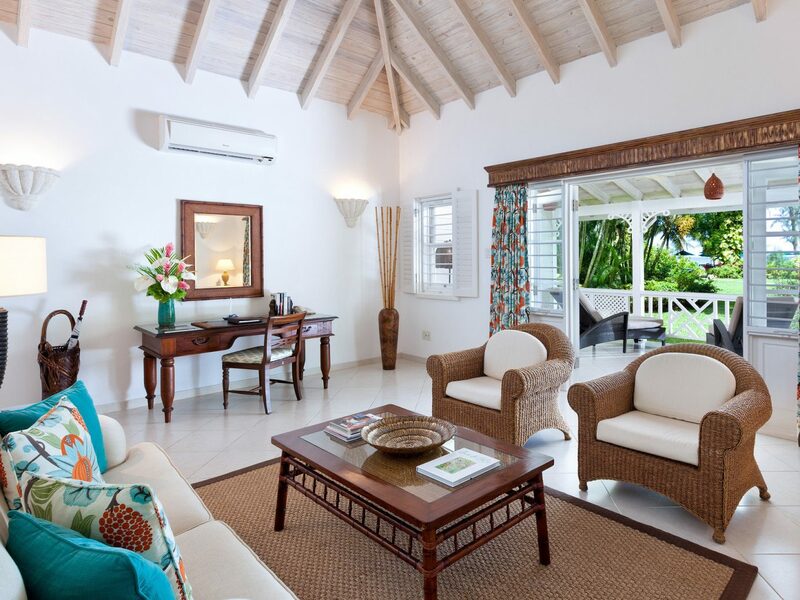 The relaxed Mahé Island retreat unfolds just down the road from the Barbarons and Grand Anse beaches. 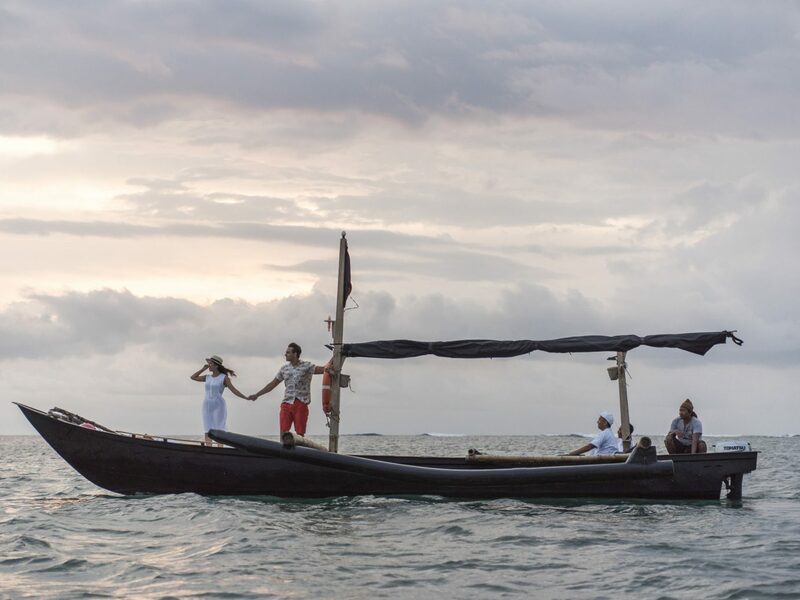 When you’re not lounging or gorging yourself on Seychelles specialties from AVANI’s Elements or pan-Asian fare from Tamarind, sign up for a traditional island cooking class, dance workshop, or nature trip. 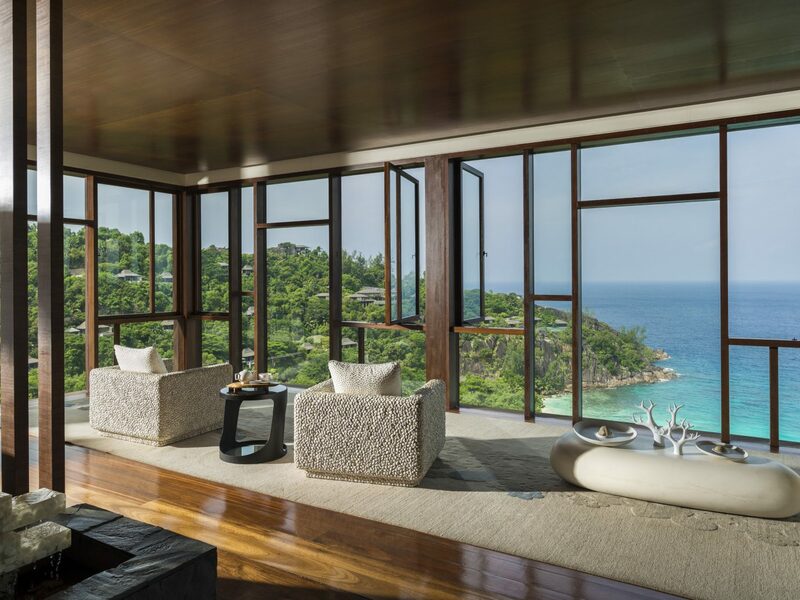 Real talk—the Four Seasons Resort Seychelles is about as utopian as tropical island escapes come. 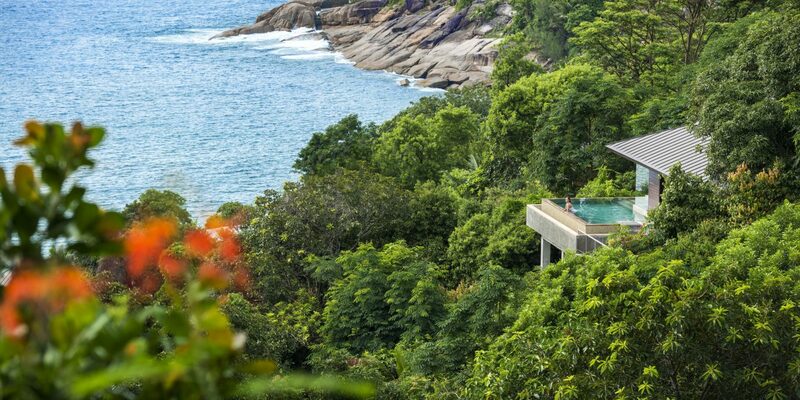 Stilted tree-house villas and suites are concealed in a swath of impossibly green jungle that runs from the property’s hillside down to the Indian Ocean’s cerulean waters. 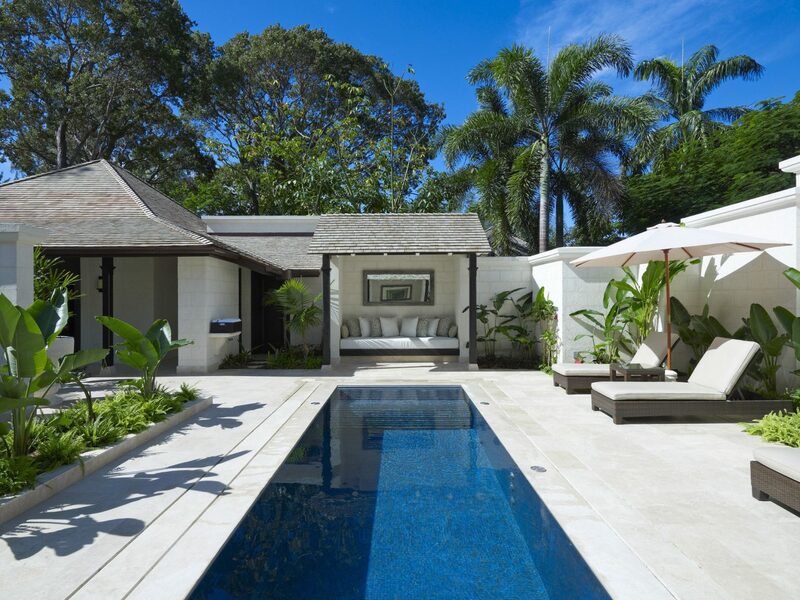 Interiors take cues from traditional Creole design, while outside, private infinity plunge pools, hardwood decks, and chaise lounges offer an ideal perch for admiring the Petite Anse Bay panorama. JS Tip: Don’t miss out on 24/7 in-villa dining!